Designed by Helen Rose, American, 1904 - 1985. Made by the wardrobe department of Metro-Goldwyn-Mayer, Culver City, California, founded 1924. 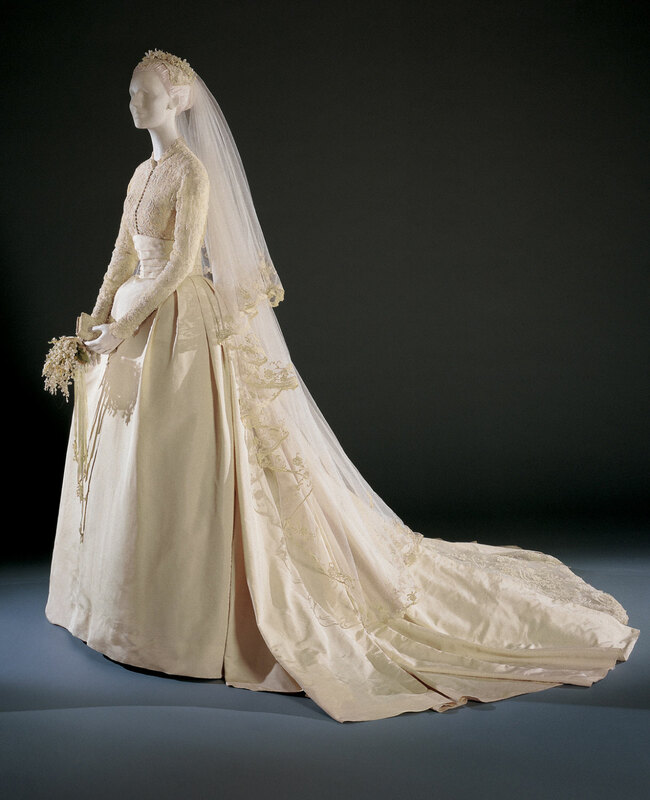 Worn by Grace Kellyat her marriage to Prince Rainier of Monaco, American (Philadelphia), 1929 - 1982. From the crownlike wreath topping the headpiece to the bows down the back of the graceful train, Grace Kelly's wedding ensemble is simple but exquisitely detailed. Delicate rose point lace, a type of nineteenth-century Brussels needle lace that features elaborate floral motifs, forms the bodice, which appears seamless because the lace motifs were detached from their original ground and pieced together to follow the shaping of the dress. Touches of the lace, accented with lustrous seed pearls, unify the gown and accessories. The dress itself is constructed in four complex parts: the lace bodice with an attached underbodice, skirt support, and slip; a heavily pleated silk faille skirt that incorporates a smoothing petticoat, ruffled petticoat, and foundation petticoat; a triangular tulle and lace train insert; and a pleated silk faille cummerbund. 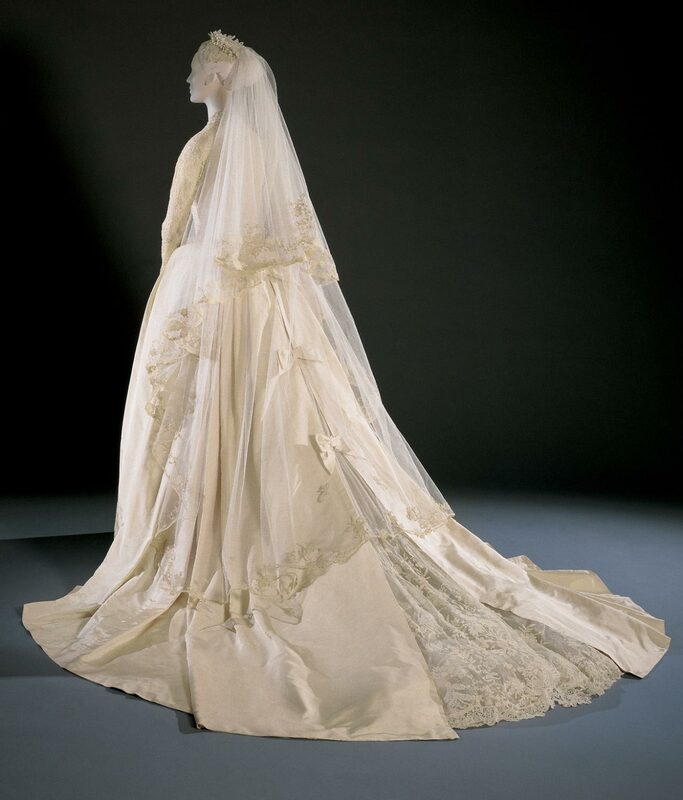 Movie actress Grace Kelly, a Philadelphia native, wore this gown for her wedding to Prince Rainier III of Monaco on April 19, 1956. A gift from her studio, Metro-Goldwyn-Mayer, the dress was designed by Academy Award–winning costume designer Helen Rose, who had created the star’s wardrobe for four films, including High Society and The Swan. MGM’s wardrobe department constructed it with meticulous care under strict security. In style and detail the dress was conceived to complement the bride’s fairy-princess image. The bell-shaped skirt of ivory faille, supported by three attached petticoats, fans out into a graceful lace train; the high-necked bodice of antique Brussels lace was re-embroidered to render the seams invisible and then accented with seed pearls. Lace embellished with pearls covers the accompanying prayer book, shoes, and cap, which is surmounted by a wreath of orange blossoms. The circular veil was designed specially so as not to obscure the bride’s famous face. As a Hollywood star, Kelly was renowned for her beauty and talent—recognized by her Academy Award for best actress for her role in The Country Girl (1954)—and for her understated, classic style that inspired the fashion phenomenon known as the Grace Kelly Look. As a royal bride, her magnificent yet simple ensemble incited intense interest and admiration. Shortly after the wedding, the princess presented the gown to the Museum, where it has become one of the collection’s most popular and beloved objects, and continues to serve as the ultimate exemplar of bridal elegance. H. Kristina Haugland, from Philadelphia Museum of Art: Handbook. Philadelphia: Philadelphia Museum of Art, 2014, pp. 336–337. 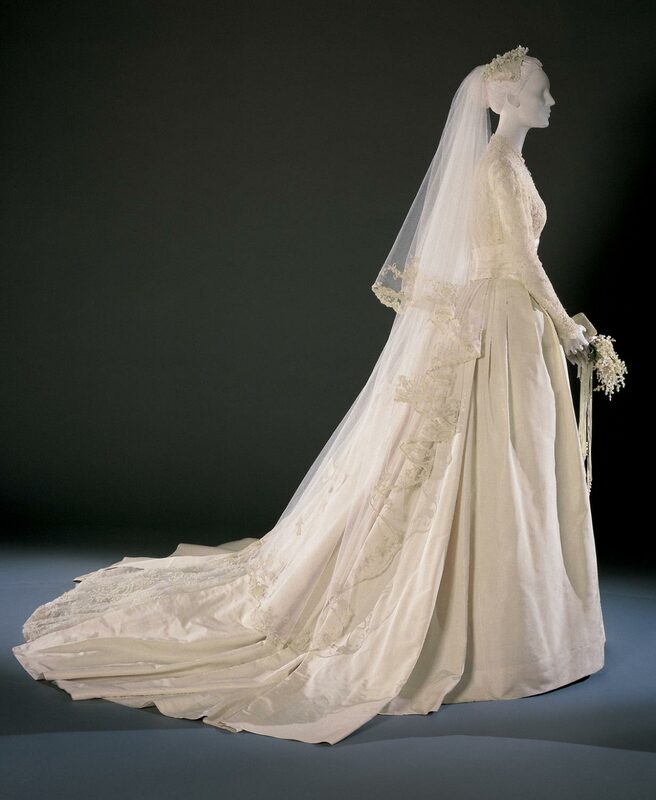 Movie actress Grace Kelly, a Philadelphia native, wore this wedding dress for her marriage to Prince Rainier III in the cathedral of Monaco on April 19,1956; Academy Award-winning designer Helen Rose, who had created Kelly's costumes for the films High Society and The Swan, was chosen to design the gown, which was constructed by the MGM wardrobe department. In style and detail the dress was conceived to complement the "fairy-princess" image of the bride. Above a bell-shaped skirt of ivory peau de soie supported by three petticoats, a high-necked bodice of Brussels lace was re-embroidered so the seams would be invisible and then accented with seed pearls. Pearl-embellished lace also covers the prayer book, shoes, and cap, which is surmounted by an orange-blossom wreath. The circular silk net veil, especially designed so that the bride's face could be seen, is decorated with appliquéd lace motifs including two tiny love birds. H. Kristina Haugland, from Philadelphia Museum of Art: Handbook of the Collections (1995), p. 100.